How to Wear Culottes Pants Right Way? Two or three years ago only the most fashionable women knew about culottes. But experts predicted that these pants will gain incredible popularity and will not leave the leadership positions! Take a closer look at the fashion trousers. If there is not this stylish thing in your wardrobe yet, then it’s worth to think about buying! 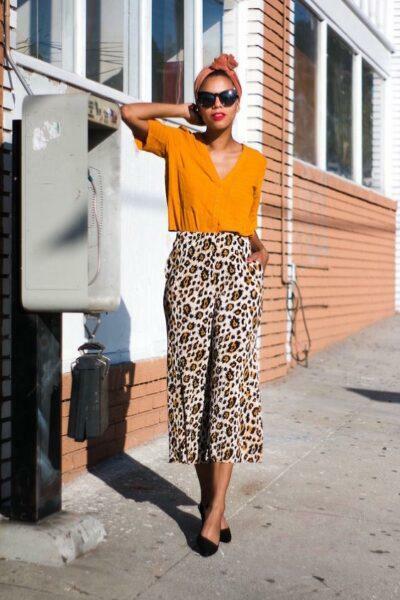 Culottes are wide, short pants, usually knee-length or calf-length. Some bloggers compare them to trousers-skirts, others — to clown pant. Some fashion experts scare women by the fact that they are not suitable for everyone, and the selection of clothes with culottes should be carried out with incredible scrupulousness. KSISTYLE decided to make new look at fashion culottes trend and draw her own conclusions! How to wear culottes trousers? The non-standard length of the culottes — to the middle of the shin — visually shortens the figure, making it more rounded. Therefore, girls with fluffy hips should be pretty neat about the choice this pant. But this does not mean that chubby women should completely abandon them! 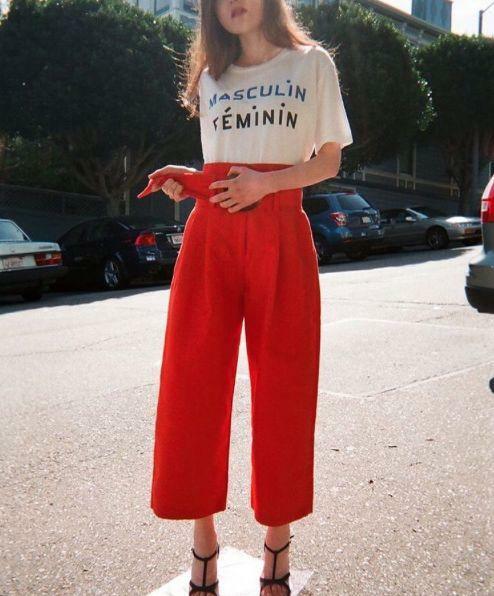 Culottes for full women is a great solution! All the secrets of combining things have already been revealed by our experts. 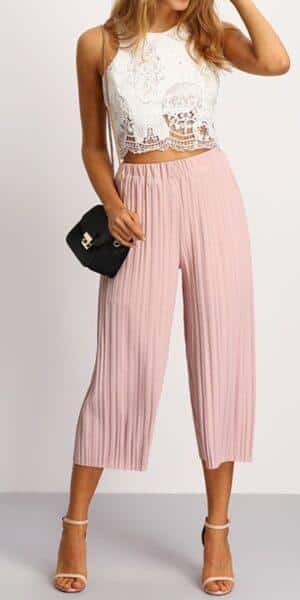 Look at great culottes outfit for plus size women. 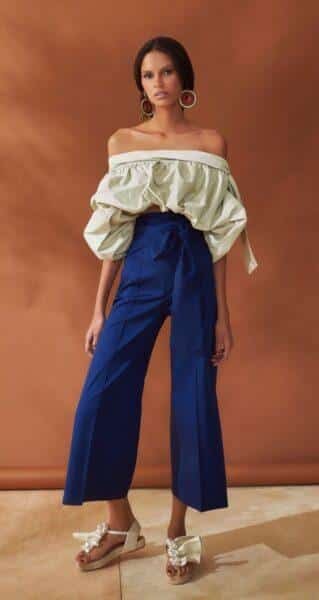 – How to wear culottes if you are short? High heels shoes are the most suitable for culottes outfit. So you can make legs longer visually, which will slightly improve the situation. If your figure is perfect, then boldly combine wide trousers with flat soled shoes. – The culottes can be sewn from a fabric of varying density. There are jeans-culottes and light pleated pants. Accordingly, you can select culottes for any season of the year. – Culottes can be combined with many items of the wardrobe, creating stylish modern images. Fashionable trousers will be suitable for daily use and for holidays, for official meetings and visits, for travel and workdays. It is important to consider the texture and coloring of the fabric, to correctly pick up all the things in the kit. Read the article to the end, and you will know all the secrets of successful combinations of fashion trousers in a harmonious manner. – Appreciate the sufficient versatility of culottes trouser in terms of selection of shoes. Check it by viewing the presented photos. By the way, women has more freedom in combining shoes and fashion trousers today. 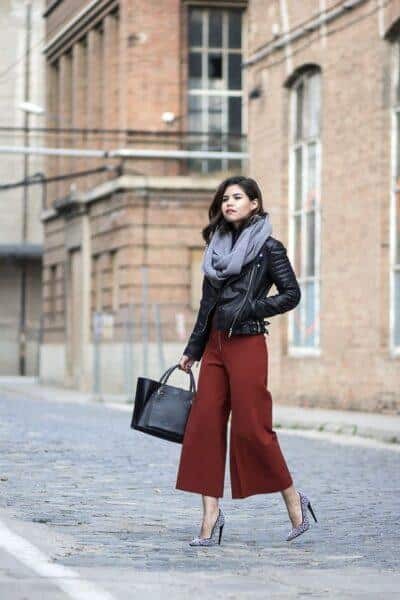 Culottes can be worn at any time of the year, but in the fall and spring, when the weather is pretty cool, they are most in demand. With what shoes do you wear culottes? The figure will look slim visually, and the image will be pretty feminine and harmonious. It is shoes with heels that are most suitable for fashionable short trousers. Such an ensemble is recommended in the first place by stylists: the proportions of the figure will be perfect, and with the heels you will look slimmer. How to wear culottes with flats? Most often, you can see the culottes in combination with the heels. But this does not mean that pants can not be worn with flats. Of course, your legs will not look as long as with heels. But you need to know a simple secret to create a harmonious image. Incredibly convenient! An excellent ensemble for long walks. High slender girls can easily choose this option. To light pants made of thin fabric, you can put on sandals on a wedge or high heels. Stylish mules shoes, which we have already described in our publications, will further strengthen the versatility of wide trousers. Selecting the top will determine the style that you want to create. This combination is quite acceptable. 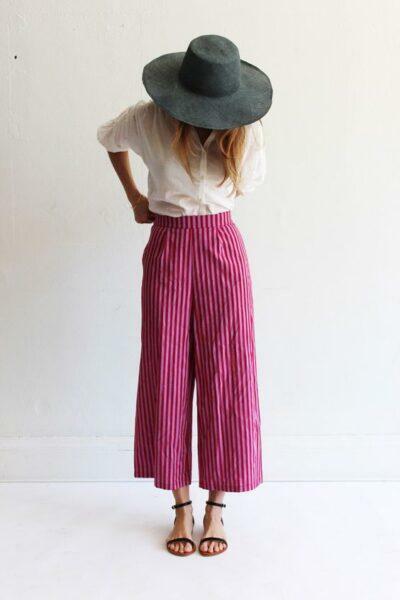 It is recommended to use the ensemble «culottes-sports shoes» for slender girls with a good figure. It will be to around the body line, which will benefit them. Warm culottes will cover the top of the shoe. The ankles will look quite elegant. You will demonstrate all the advantages of high boots. The image is very harmonious. Heels, wedge or flat? It all depends on your personal style. Replace tight shoes with light and comfortable espadrilles in the summer. Experts advise you to choose the platform espadrilles or wedges. Culottes are becoming more popular with every season. They appear on the catwalks and in the fashion sets. And even in business images! Do not believe me? Look at the photo! Fashionable culottes trouses were part of the casual image recently. Today wide pants have expanded the scope of application. They can be worn on a date. Culottes may be a part of the bisness style. But not classic! If you want make stylish image with wide trousers, you must adhere to the generally accepted rules. Сulottes can be worn with the same things as trousers. Designers offer very often this outfit. It is very practical for cool weather! 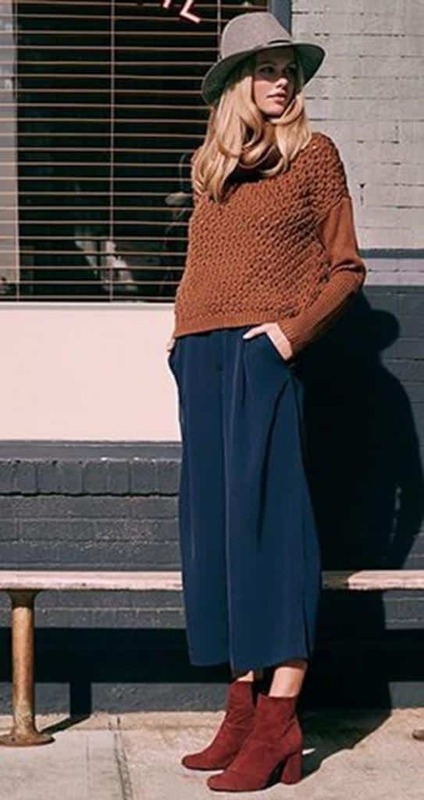 The fashion of the year allows you to combine culottes even with voluminous oversize sweaters! Modern fashion dictates femininity, but welcomes in the wardrobe things borrowed from men. Shirts will add seriousness along. This image is suitable for office. But to the fashionable dresses-shirts, choose tight trousers, and not free culottes. It is perfect set for a summer walk! Dark color trousers combine wish t-shirt any shade: white, bright, with pictures. Print trousers wear with monotonous T-shirts. Create a sea image with a striped t-shirt. Get a playful, joyful mood! Form an outfit to go on holiday, meet with girlfriends and visit the cafeteria with a childhood friend. Culottes is a worthy company with semi-transparent and lace blouses. In this case we will get the official style. Not strict, but very interesting! Choose slightly elongated jackets to make the image harmonious. 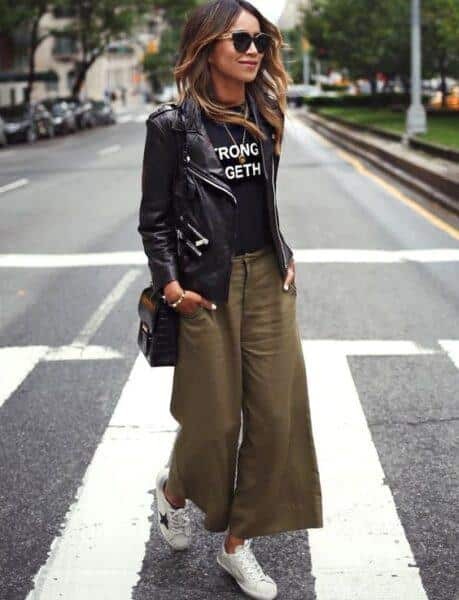 Сulottes pant and leather jackets will be a perfect pair. Do you like jeans jackets? Feel free to combine them at light youth image! Winter ensemble complement the outer clothes of medium length. Too short coats will be inappropriate. Good choiсe is a coats in a military style. More culottes outfit ideas you can view on the video. Fashionable stylists advise to combine things exactly like that! Enjoy watching! Making Dorm Decor from Ikea Items!